I remember a Batman comic book I read when I was a kid. In it, the Joker kidnaps Police Commissioner Gordon. When word of this gets out, the citizens of Gotham City immediately begin smashing windows and looting stores. The absurdity of this made me laugh. I realize now, however, that this was no joke. This was the logic of the police state: the lower orders must be kept in awe of authority, otherwise all hell will break loose. This is why some people see nothing wrong with police officers beating up Occupy protestors or shooting black teenagers. It is also the logic behind the exaggerated fear of mob violence that exists among the ruling elites in this country. After the earthquake in Haiti, shipments of food and medicine were held up, because, we were told, “order” had to be restored first. Much the same thing happened when New Orleans was flooded. Jonathan Nolan and Christopher Nolan, who wrote the screenplay for The Dark Knight Rises, must have read that same Batman comic book that I did. When, in this movie, the bad guy, Bane (Tom Hardy), traps the entire Gotham City Police Department in the subway, angry mobs suddenly appear out of nowhere and start looting people’s homes. Lest there be any doubt as to the film makers’ political inclinations, Bane has his followers storm a prison and release all the prisoners. This is clearly meant to put us in mind of the storming of the Bastille. It’s been over two hundred years since the French Revolution, and conservatives are still fuming about it. The story of this film boils down to this: a group called the League of Shadows wants to destroy Gotham City, because it is “corrupt”. It’s not clear why they find this objectionable, or why they consider Gotham to be worse than other cities in this respect. League member Bane takes over the city and subjects it to a reign of terror, while cutting it off from the outside world. He takes a fusion reactor and reconfigures it into a nuclear bomb. The bomb is unstable and will eventually go off by itself after some months. My question is this: if the idea is to destroy Gotham City, then why not just detonate the bomb? It appears that he wants to play some sort of mind game with Batman (Christian Bale), though the film is not too clear about this. One of the things I liked about both The Avengers and X-Men: First Class is that these films don’t take themselves too seriously. The Dark Knight Rises takes itself extremely seriously. This film just oozes self-importance, starting with the title. (Why not just call it “The Return of Barman” or something like that?) The characters give overwrought dramatic speeches. Lots of them. Hans Zimmer’s musical score ranges from lugubrious to bombastic. It is perhaps fitting that Batman is played by Chirstian Bale, the most self-important actor in Hollywood. 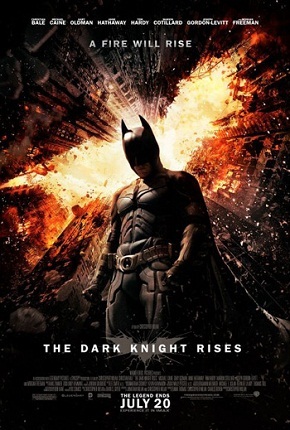 At 165 minutes, The Dark Knight Rises is way too long. You could cut a lot out of this film, and it would be a better movie. There is, for example, a subplot about Joseph Gordon-Levitt rescuing a bunch of orphans that does nothing more than slow down the story. Also, the action sequences are sometimes confusing. During a motorcycle chase scene, it looks as though Batman has captured Bane at one point, but it subsequently turns out that Bane has actually gotten away. I must say, though, that I did like Anne Hathaway as Catwoman. Unfortunately, she is off screen most of the time. I would like to have seen more of her and less of Bale and Gordon-Levitt. This entry was posted on July 24, 2012 at 7:30 am and is filed under Cinema, Comic Books, Popular Culture, Superheroes. You can follow any responses to this entry through the RSS 2.0 feed. You can leave a response, or trackback from your own site.